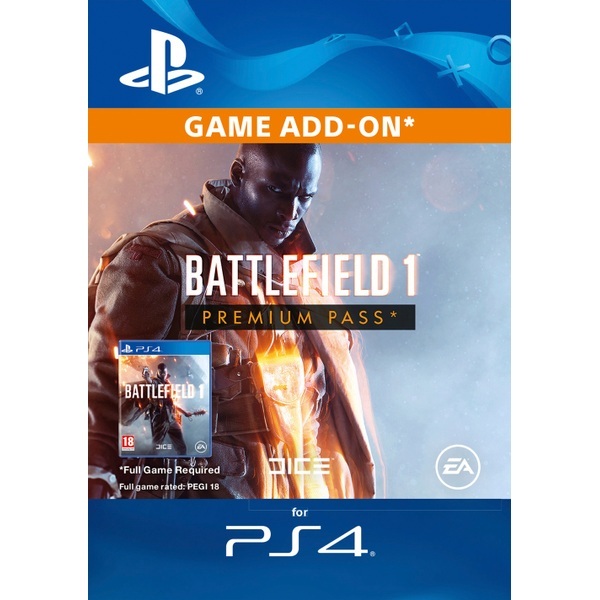 BASE GAME REQUIRED Expand the theatre of all-out war with more frontlines in Battlefield™ 1 Premium Pass* containing: Four upcoming themed expansion packs starting with Battlefield 1 They Shall Not Pass in March 2017. The expansion packs will include: • Two weeks early access to each expansion pack. • Play as new armies including France in Battlefield 1 They Shall Not Pass, and the Russian Empire in an upcoming expansion pack. • 16 new multiplayer maps. • New Operations and game modes. • New Elite classes. • 20 new weapons. • New vehicles. Also includes: • 14 Battlefield 1 Superior Battlepacks, each containing one stand-out weapon skin, delivered monthly starting November 2016. • 14 unique dog tags distributed over the course of the Battlefield 1 Premium Pass period. • Priority position in server queues.